The capacity of lotic ecosystems to influence the dynamics of nutrients during their downstream passage depends upon abiotic and biotic processes that determine uptake rates and transformations, and these in turn are governed by a number of environmental factors, especially discharge and its variability. 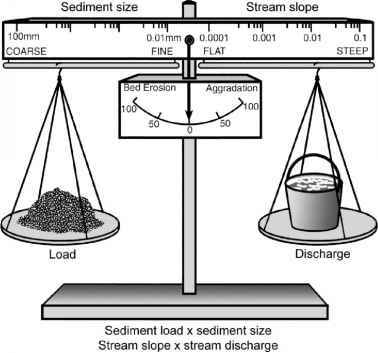 Meyer and Likens (1979) suggest that streams can occupy very different states in terms of nutrient processing: a throughput mode at high discharge, and a processing-retention mode at low flows. Streams with high rates of nutrient inputs relative to processing capacity and flashy flows will be in throughput mode most of the time, whereas streams with low nutrient inputs relative to demand and more stable flows will be in processing-retention mode more of the time, especially during the growing season. Channelized agricultural streams are a good example of the former (such as Illinois farm streams, Royer et al. 2004), and undisturbed small woodland streams of the latter (such as Walker Branch, Tennessee, Mulholland 2004). Even under the conditions of base flow when nutrient studies typically are conducted, rates of nutrient uptake and transformation vary considerably. A 15N tracer study in headwater streams from biomes throughout North America reported wide variation in rates of ammonium uptake and its nitrification to nitrate (Peterson et al. 2001), and equally wide variation was observed among multiple streams within the Hubbard Brook Experimental Forest, New Hampshire (Bernhardt et al. 2002). Stream size explains some of this variation, because smaller streams have a greater area of streambed relative to water volume. In addition, abiotic exchange mechanisms are influenced by sediment characteristics, pH, and nutrient concentrations in streamwater, and biotic uptake and release varies with overall biological productivity. Current evidence documents that in small streams that are not overly enriched, instream processes exert considerable control over nutrient cycling and transport under low-flow conditions. Evidence also suggests that transport dominates instream processing to a greater degree in larger rivers, and transport has primacy during episodic high flows when the majority of annual nutrient export occurs.